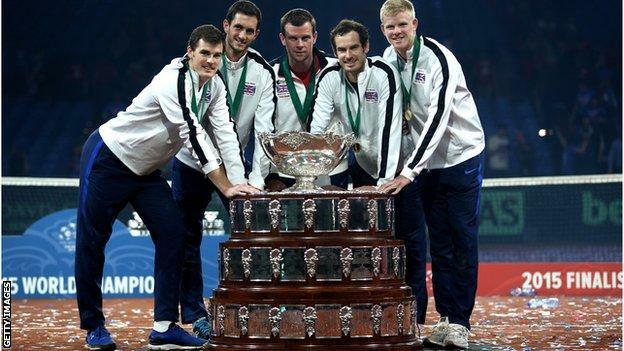 After Great Britain’s dramatic victory in the Davis Cup, Andy Murray has urged the British tennis authorities to build on the legacy of becoming the sport’s world champions. He says it would be wasted opportunity not to act quickly. He really has a point. Imagine if we had just the FIFA World Cup – after weeks of solid partying, we would then be talking about a ‘new dawn’ for English football. Had we won the Rugby World Cup, we would be bragging about how we had finally overcome the dominance of the southern hemisphere teams and, as inventors of the game, brought the Webb Ellis trophy back to its rightful home. But, having won the world cup of tennis – and tennis is hardly a niche sport – we are feeling happy, but hardly delirious. What does Andy Murray have to do?? We are world champions – this is a BIG DEAL. What does this say about tennis in this country, and how it is promoted and funded? One thing that sponsors and brands should certainly have noticed from the last two Davis Cup events – in Glasgow and Ghent – is the sky-high level of fan engagement. Wimbledon is good, but the noise and frenzy of the Davis Cup really shows what our tennis fans are made of. Britain clerarly a huge and passionate fan base and, at last, something to cheer about. One of the first things should be to tap into this passion, and sustain the momentum – not only behind Andy Murray, but British tennis as a whole. No doubt the future Sir Andy Murray (surely a knighthood is in the bag?) has just added a few zeros to his marketability and brand value. But his appeal can also add value to the whole sport. British tennis should use this success to boost sponsor involvement, helping to fund more grass-roots participation, better facilities and, importantly, extending tennis’ appeal beyond its middle class, middle England homeland. Like the Williams sisters, who grew up in the crime-ridden LA suburb of Compton, tennis needs to appeal to more inner city British kids. Sponsors can play a role in this – not only engaging the fans, but also the next generation of players. Andy Murray is right – let’s not waste this opportunity. But it’s not just down to the LTA – the commercial partners of tennis and the brands that have not yet considered investing, also have a crucial role in ensuring this incredible victory isn’t just a flash in the pan. It requires a long-term view and serious investment. The true test of success will be to see how long it takes us to win another Davis Cup after Andy Murray retires. Let’s hope it’s not another 79 years.